I was doing some character sketches at work, and came up with something for our Mechanists (whatever we're calling them). It's one idea...I want them to look like a combination between engineer, inventor, and mad scientist. Very nice! I like the concept. We would need "poseurs" too. The flock that gathers around the true artisans to shine in their light. Yes! Excellent. I like it. I think we agreed they'd all look different anyway, so we'll probably need at least 6 different ones. Obviously we still want to tie them together visually, but only in a subtle way. Nice, looks good! The head looks a lot like Ben Franklin, but that's not necessarily a bad thing. Yeah, I definitely want to do a more mad-scientist head as well. In terms of modeling, Odd, how many do you think we need? 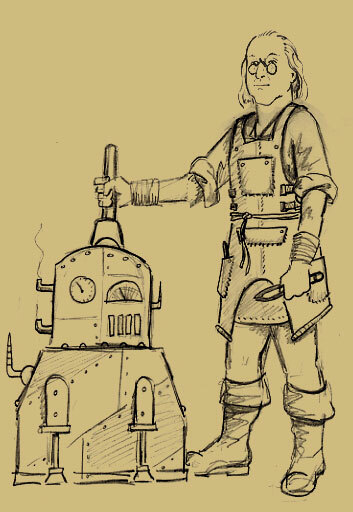 I can see adding a few different heads, but regular townsfolk bodies could be used for mechanites that weren't currently working (and thus wearing an apron), couldn't they? I don't want to add to your workload unnecessarily. It gives him a whole "looka t my beautiful creation" look. I like it. Seems a bit too 'hands on' perhaps, like a trusty worker who might be helping the main mad inventor. If you give him some more victorian clothes underneath that apron, like a high collar, and perhaps an unshaven wispy beard and long pianist fingers, he might look more the part. It might seem odd that's he's dressed up to do such dirty work, but that all plays into the 'head in the clouds' mechanite persona. While Ben Franklin's head looks altogether too sane and reasonable, I love the glasses. I was tempted to suggest goggles or safety glasses, but I'm not sure if they had the materials to make safety glasses in those times. They definitely couldn't make polymer/lexan glasses, but maybe they could just make really thick glass for a safety barrier. Working with steam is pretty dangerous, at any time a bolt could fly out and shoot you in the eye. IRL, one of my friends was working with a mechanical press in a lab, compressing something, and all of a sudden one of the bolts just shot out and hit him right in the safety glasses, would've got him right in the eye without them. So anyway, I think some sort of goggles would be appropriate. Seems a bit too 'hands on' perhaps, like a trusty worker who might be helping the main mad inventor. Well, my take was that they would do all their own work, since they don't want others learning their secrets. I would expect them to be hands on. Thanks GIMG! I wanted to add something like that to one of the versions, but didn't have a good reference at work. Ha! Every mad scientist has his Igor. 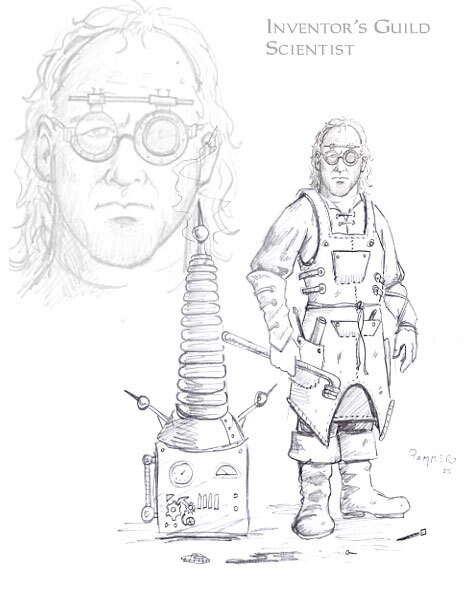 True, but Igor would also be a mechanist, under this model. If they are a guild, then only guild-members will be allowed to help with the work. They will have apprentices to do the grunt work, but they're all mechanists. They had glasses already in Thief so they can as well get some safety glasses. I had an idea that since these guys are non combat civilians really, and they are protected by their machines, what happenes when one spots you is that they run to the nearest alarm switch and press it, which brings the combat bots out on patrol, and makes a lot of secuirty gates close over all the doors. Now, the security gates will open automaticaly for the patroling bots, so you'll have to try and squeeze past them when your opportunity arises. This security state can last for n minutes based on gameplay testing, but if you trip the secutity 3 times, it's permenant. This would be something for our campaign only. I think they should be armed with pnuematic dart guns! There's no reason for these guys to be armed with anything. They're weakling cowards who hide behind their machines. You'd stand as much chance of being attacked by a gay chartered accountant, who's only tactic would be to disorient you with wry comments on your choice of clothing. I'm an engineer back in the day, and I have the knowhow to create a pnuematic dart gun as a last resort, personal defense weapon. It would only fire a few shots before the compressed gas supply ran out, so it really would be a last resort. As in, someone is chasing me with a sword and has me cornered. What possible reason would I have not to make that gun, and instead decide to be a weakling coward who hides behind a bot? It might be better for gameplay to have them unarmed and run to get their bots, but I don't see the logical reason behind it. At least give them a small crossbow or something. I know they don't have any combat skill, but they have enough engineering knowhow to make some personal weapons that can be somewhat effective regardless of combat skill. Edited by Ishtvan, 29 April 2005 - 02:08 AM. Yeah, how many movies have you seen where the nerd defeats the bad guy with some amazingly smart device or plan he thought up. These are normal people, like civilians,. Normal people don't carry weapons. THey have no fear of attack in their buildings, surrounded by their protective devices, cameras, alarms, traps and safeguards. Anyway , no thief would murder an unarmed scientist. Why would they expecting someone to break in and kill them? It also makes a nice change to have an unarmed faction in the game. That term "gearheads" is a good idea. We could use that term in some talks between "normal" folks, it could even be used as a synonym as crazy by towsfolk, because they don't understand them. That would be something for NH to include. Soemthing like "Stop acting like a gearhead". I agree with Odd that they shouldn't be armed. I wouldn't mind giving them flashbombs though, to use as a defensive tactic. They blind the enemy, then run away and summon their bots. Sounds fair to me. Of course, FM authors can give them swords and hammers if they want to. They should defend themselves if they're cornered, it'd make sense that they'd carry around a dagger or other form of protection. But overall their attacks should be pretty weak, they're not much of a threat by themselves. Will our regular civilians be carrying daggers? That was something I had considered an interesting idea...they would flee whenever possible, but if someone is chasing them and they're cornered, there's a chance that--instead of cowering and just taking it--they pull out a dagger and slash wildly around.